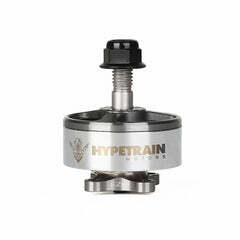 Hypetrain Motors is proud to introduce the Hypetrain Blaster 2207 2450Kv Motor! This is the first motor in the FPV Community to be backed by a Replacement Program! The design of the Hypetrain Blaster resembles a Radiation Hazard symbol, evoking memories of Rotor Riot’s radioactive adventures in Chernobyl. The top of the bell is made from aluminum and anodised to a sleek matte black finish, while the steel magnet ring is black with beautiful gold plated highlights. 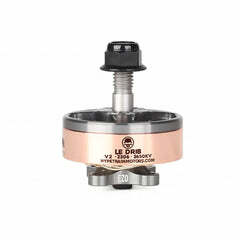 The distinctive bell is supported by a weight saving hollow-core steel shaft, and held in place with a hex shaft screw, facilitating motor service. Through the implementation of an open, “naked bottom” type aluminum base, the Blaster reduces excess material to a minimum, saving weight while reducing heat accumulation in the motors stator and windings. The base maintains the standard Hypetrain 16x16mm mounting pattern, which optimizes mounting options, maintaining compatibility with older frames and saving an extra bit of weight. The Hypetrain Blaster is built on a 2207 stator, which provides explosive throttle response on the top end with great control feel, and the copper winding specifications have been tuned to achieve a balanced 2450kv, optimizing efficiency for most 5” propeller choices on the market while increasing throttle resolution. In other words, if you’re looking for a motor for a 5” quad, with excellent balance between performance, agility, speed and efficiency, the Hypetrain Blaster should definitely be high on your list! And not only do they perform great, they are also backed by our Fly Hard Replacement Program! We believe pilots progress faster when you remove the fear of costly mistakes. We created the FLY HARD Replacement Program to give pilots more confidence to push the limits of their skills by reducing the fear of crashing and damaging components, ultimately creating greater enjoyment when challenges are met! The FLY HARD Replacement Program facilitates FREE replacement motors. We are very excited to introduce this Program to the FPV community, and are looking forward to hearing about how the program helps you grow your skills in FPV!